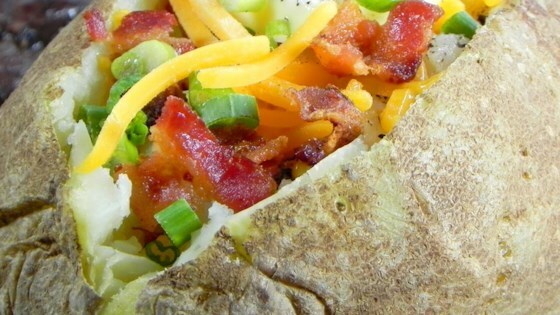 "A step-by-step recipe for making a baked potato. Serve with your choice of toppings. Try sour cream and chives, cheese, and olives." Scrub the potato and prick it with a fork to prevent steam from building up and causing the potato to explode in your oven. The potatoes came out perfect. I first sprayed the potatoes with PAM and seasoned them with seasoning salt and cajun seasonings then wrapped them in tin foil. YUM YUM!